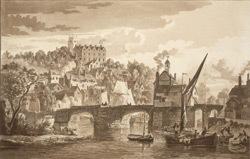 View of Bridgnorth in Shropshire, a prosperous town in the 18th century due its cap and hat-making industry and river trade. It was not as fashionable as nearby Ludlow or Shrewsbury. As can be seen in the picture, it lies on a high sandstone ridge rising from the bank of the River Severn. Many of the 17th- and 18th-century buildings shown here are still standing, and the Low Town and Mill Street areas have facades from different periods. The bridge in the picture was replaced in 1823. The engraver, Paul Sandby (1725-1809), was one of the most influential English watercolour artists of his time.